In this winter of bitter cold temperatures and never ending snow what could be more welcome than an escape to the tropics. 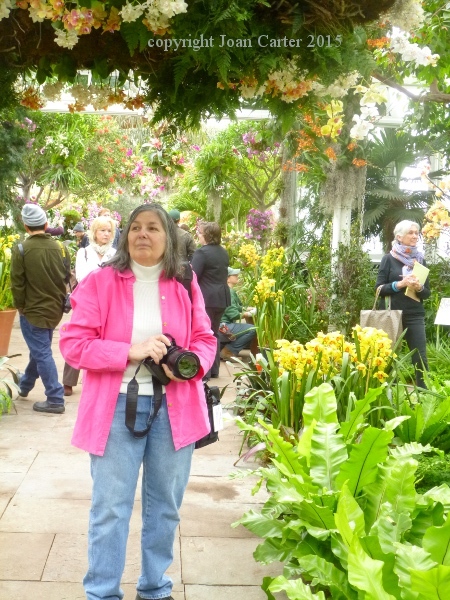 If you are unable to fly away, perhaps there's something more accessible, closer to home - a visit to the New York Botanical Garden for a visit to their 13th orchid show in the Enid A. Haupt Conservatory. We'll just go over there . . . .
- even if only for a while - we've left winter behind. Every year the orchid show has a different theme. Last year it was orchids of Key West in Florida. Before that, Broadway set designer, a Frenchman noted for his living walls, a Cuban born landscape designer. 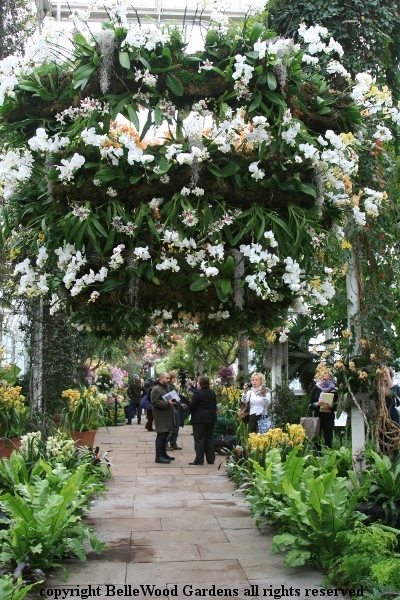 This year it's chandeliers of orchids. Say what? Indeed. When I read the announcement for the press preview I was somewhat puzzled. Would there be candles . . . no, the heat would be a problem, they'd burn down and drip. Perhaps strings of Christmas lights, the tiny white LED kind? Maybe they'd even twinkle. No. More like exploding fireworks of orchids in profuse bloom. First the concept, then the creation, and lastly the installation. And it must have been tricky. For example - how are you going to water them? Obviously not while visitors are parading beneath them, heads turned upward in admiration. 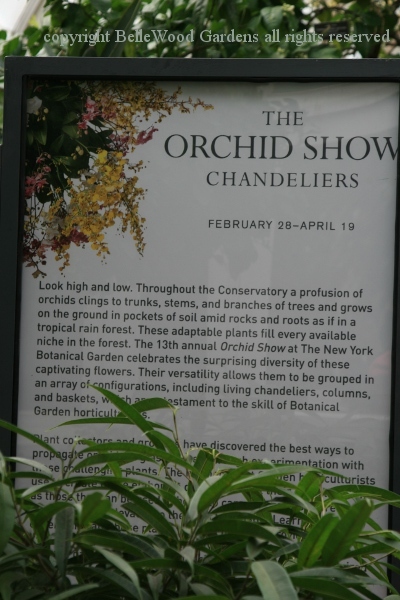 Marc Hachadorian, Manager of the Nolen Greenhouses for Living Collections and curator of orchids, explained that the orchids were unpotted. Then the root balls were wrapped in sheet moss before being symmetrically arranged into the "chandelier." Just to complicate things, each flowering stem has to be staked and tied for support. And then this whole fragile, heavy, floriferous mass has to be hoisted up and supported with cables from a crossbar up by the conservatory roof. Who thinks these things up? 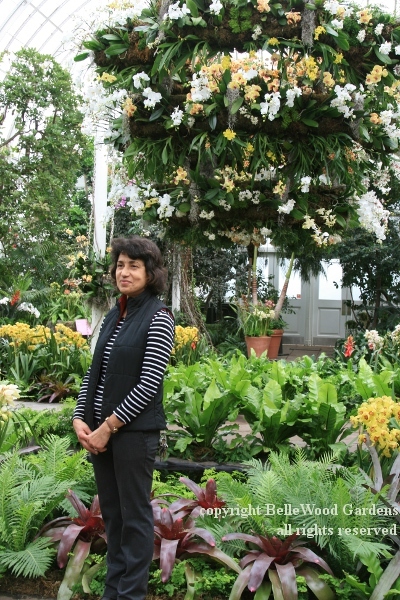 In this case it was Francisca Coelho, Vice President for glasshouses and exhibitions. 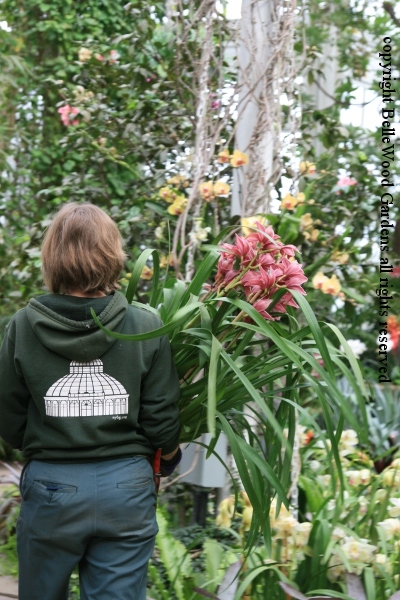 She is intimately familiar with the Enid A. Haupt Conservatory, having been deeply involved with its major restoration (which took four years, from 1993 to 1997.) 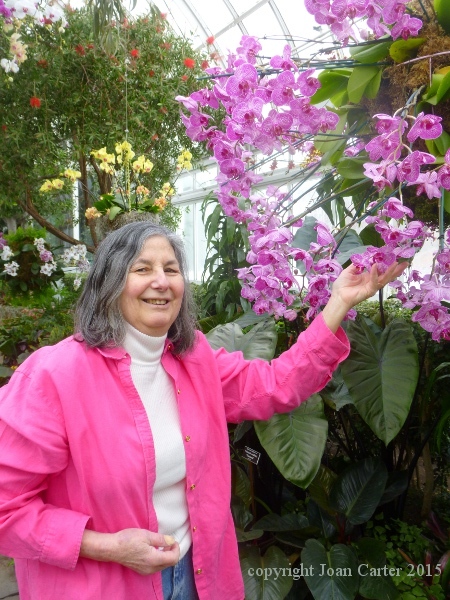 Her experience with exhibition-related planning and implementation meant that when she suggested the concepts and design for this year's orchid show she knew just how things would fit together and how it all would work. Today is Thursday, press preview day. Tomorrow, Friday, is members day. And on Saturday, 28 February, the exhibition opens to the public. The final embellishments and tweaks are being attended to. Nothing frantic, mind you. 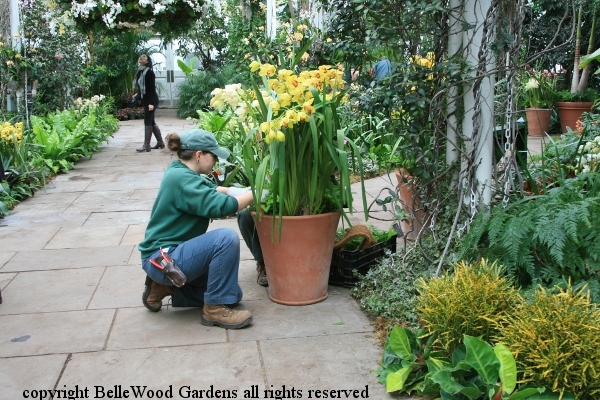 Just more pots of orchids being carried from here to there for installation in the large pots standing on the floor. Endless boxes of sheet moss to be cleaned of sticks and twigs, then soaked, and carefully tucked around the orchids to disguise the potting medium. Orchids, absolutely. 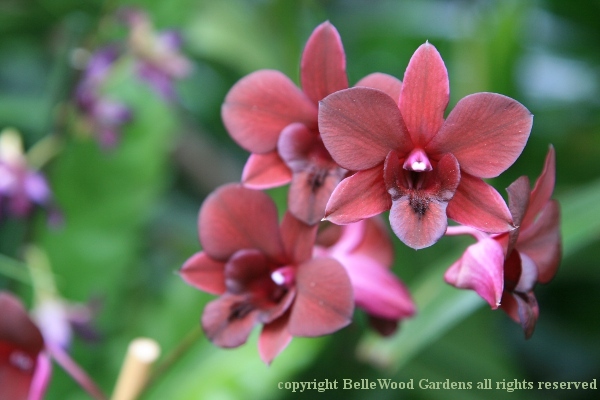 There are the orchid chandeliers, orchids in decorative pots, orchids at ground level nestled in with foliage plants - bromeliads, ferns, cordylines and more. The exhibition runs through Sunday, 19 April. And in that 7 week period plants will be replaced as needed to provide visitors with a splendid display from opening day to closing weekend. 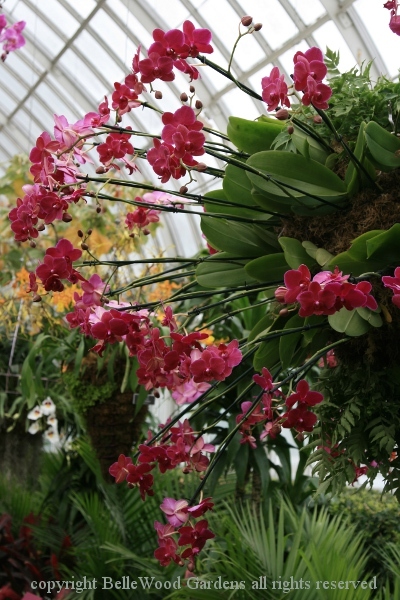 Scads of Phalaenopsis, lots of Cymbidiums, oodles of Cattleya, hundreds and hundreds. Yet the overall effect is one of lightness and airiness. Who could keep from smiling. 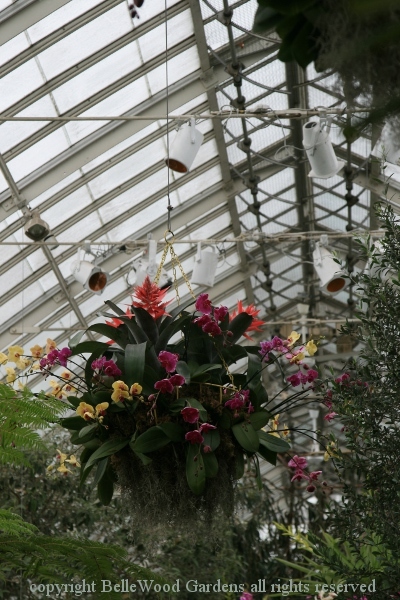 The massive centerpiece stretches across four beams of the corner house of the Conservatory's Seasonal Exhibition wing. 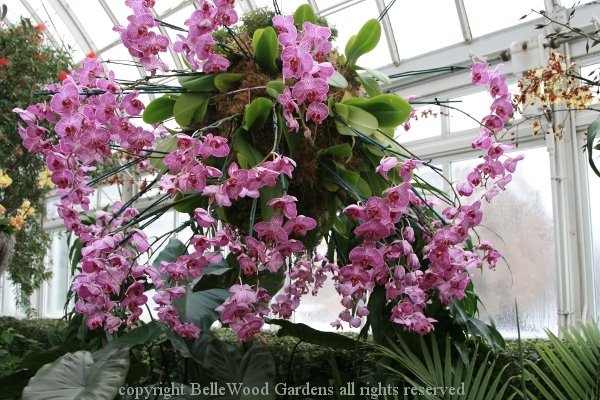 Rising in four tiers, each larger as the layers reach toward the crystal palace roof, but not solid so you can stand directly beneath it and gaze upward with delight as the sprays of orchids shimmer in exuberance. So much to see. What shall I photograph next . . . . 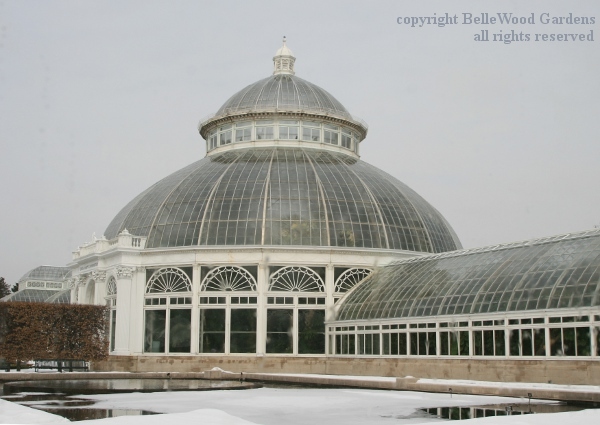 Located in the Bronx, New York, the Garden is easily reached by Metro-North Railroad with a stop directly across from one of the garden's entrance, by subway, or by car (Bronx River Parkway exit 7W. The Garden is open Tuesday through Sunday, and Monday federal holidays from 10:00 a.m. to 6:00 p.m. 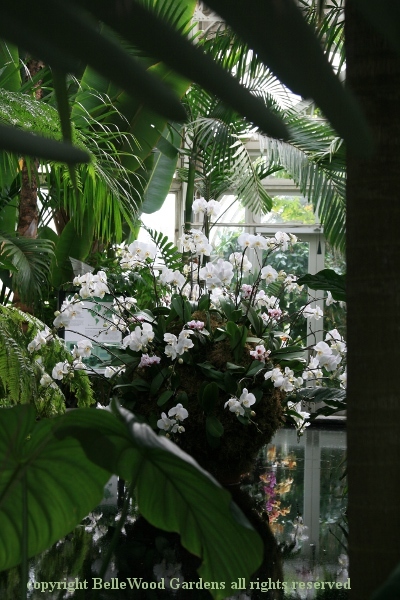 The Orchid Show has some special evening hours and the display is truly magical at these times. For ticket pricing check their web site or telephone 718.817.8700.